ARS has added modular skids to its line of dust collection systems. The DC9 is a portable dust collector that easily transports where dust control is critical. Diesel- or electric-powered systems are available. Each has convenient side loading, vertical hanging filters allowing effortless change out. This compact system has a 99.9% @ 0.5 micron efficiency cartridge with ram injection pulse cleaning. The unit can be trailer mounted for a completely mobile dc unit. 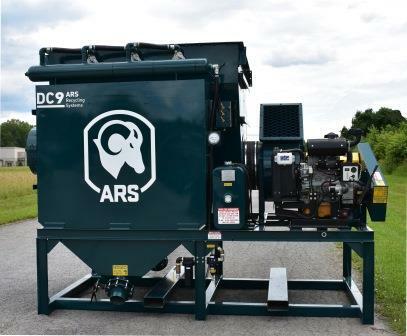 The DC9 was originally designed as part of the ARS G-Series, a complete abrasive blasting-recycling system geared towards use in blast houses or blast yards. Each modular skid of the ARS G-Series can be purchased separate or as a system package.